There are so many sizes and types of scaffolding out there it can be overwhelming when you are making your first purchase. A good idea, if you are new to the scaffolding game is to invest in a simple, Kwikstage mobile scaffold system first. 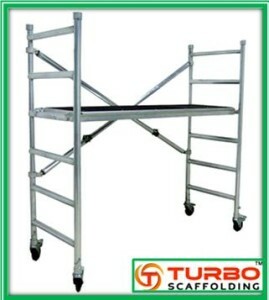 Mobile scaffolding is perfect for lighter duties and not as overwhelming to assemble and dismantle as some of the larger, more commercial scaffolding kits. Before you run out and buy your first mobile scaffolding system it is worth taking stock and learning about the regulations and health and safety guidelines around working at height and scaffolding. Whether you are a tradie or working on your own there are still guidelines and recommendations for safe working at heights. Below are some quick facts and tips to consider before purchasing a mobile scaffold system. 1) Budget vs. Safety: There is no competition here and safety wins every time. Look for a high quality, certified manufacturer which sells new systems. You will want to know where your scaffolding has come from and if there are any defects and weaknesses. Buying new scaffolding gives you peace of mind, warranty and guarantee of workmanship. 2) Material: There are plenty of cheap imports out there but to get return on your investment and long lasting product safety, look for aluminium or galvanised steel frames. These frames are light, easy to transport from job to job and won’t rust or fail in extreme weather conditions. 3) Rules and Regulations: Before investing in any scaffolding system it’s wise to check out Workcover NSW or the health and safety authority in your state to ensure you buy and comply with the regulations and guidelines for working at height and with scaffolding. For example handrails need to be in place on all sides when using platforms and steps. A little research time now can save fines and worse still injury later. Mobile scaffolding can really make a difference to your building project whether it’s a professional job for a builder or a DIY enthusiast who needs some extra equipment to work at height. Great for building work, windows, carpentry and gutters, a mobile scaffold system is a great investment especially if you make a safe choice.